Priority Club launched their January 7 to April 30, 2013, Stay More-promotions back in January. If you have registered for any of these variants, this one won’t work for you. You can find my comprehensive post about these promotions here. 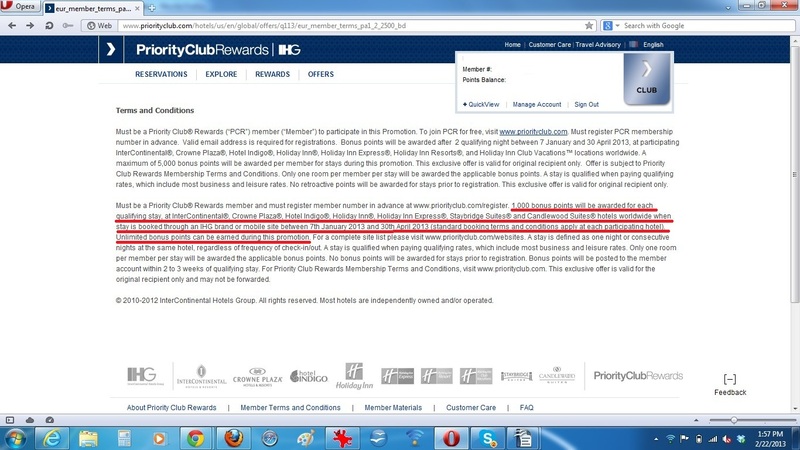 Priority Club has a version for lower number of stays that also has an online booking bonus component of 1000 bonus Priority Club points for bookings made through IHG’s websites. This is similar to the stay 2 nights get 2500 bonus points and stay two more nights and get additional 2500 bonus points BUT with the online booking bonus added. The online booking bonus component doesn’t show up in the terms and conditions of the promotions once you have signed up, but I have a screenshot of it above. Again, you should only register for this promotion IF you have fewer than FIVE Priority Club paid nights by the end of April. If you have five or more, you should register stay 5 get 10K bonus points promotions that I have explained here. You should only sign up for this promotion, if you have fewer than five pad nights at InterContinental Hotels Group properties by the end of April.